Our largest offering with 11 national products, this kit is world-class. 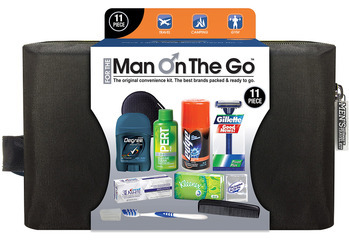 Everything every man would need and then some these TSA compliant trial sizes are packed in a stylish dopp kit. Go on. 16.125" x 8.8125" x 6.375"
6.88" x 2.75" x 5.3"
TSA Compliant Quart Sized Zip Top Bag in Blue/Black Stripped zippered travel bag with handle.